The discovery of the badly decomposing body of lawyer Willie Kimani, his client and taxi driver in Oldonyo Sabuk River in Machakos County on July 1 ended any hopes their families, friends and colleagues had of ever seeing them again, alive. The three had been kidnapped, allegedly by police officers, tortured, murdered and their bodies dumped in the river. Their killers hoped that by dumping their bodies in the river, they would never be found – or, at least, that their heinous crime would not be traced back to them. As family, friends and colleagues mourned the loss of the three and demanded answers from the National Police Service, the Nairobi Law Monthly took some steps back to retrace the history of extra-judicial killings and forced disappearances in Kenya by State officers. “To most Kenyans, the words have taken a different meaning in the recent past due to the recent spate of killings. But the truth is extra judicial killings have been a norm,” George Musamali, a security analyst told the NLM, echoing the UN Special Rapporteur on extrajudicial, summary or arbitrary executions Professor Philip Alston. The Australian international human rights lawyer was in Kenya soon after the 2008 post-election violence and documented harrowing tales of State involvement in the killings. A summary of his report was presented to the UN Human Rights Council, Geneva, in June 3, 2009. In the report, Prof Alston, who made many enemies in government during his time between 2008 and 2009, had discovered the institutionalisation of the extra-judicial killings and forced disappearances. And he was alive to the fact that his report had touched a raw nerve when he asked the UN Human Rights Council “to ignore much of the background noise that has been generated” and focus on the findings. In the findings, which unsettled the Kenyan government, Prof Alston directly linked police to forced disappearances and summary executions. “In a five-month period in 2007, the Kenya National Commission on Human Rights (KNCHR) documented approximately 500 people who were killed or disappeared. The report of a police whistle-blower, Bernard Kiriinya, subsequently assassinated in October 2008, documents, in great detail, 24 separate occasions on which one particular police death squad extra-judicially executed some 58 suspects, mostly in cold blood. The testimony clearly implicates senior officials, including the Police Commissioner. No action has been taken,” Prof Alston had said in his statement. Dr Mutua’s statement then was nothing new but the government’s policy of deny, deny and deny. From the time lawyer Kimani’s body was discovered until now, NLM has spoken to various people, most of them preferring to remain anonymous for fear of repercussions. However, these people’s statements all agree with Prof Alston’s findings about the institutionalisation of kidnappings, torture and extra-judicial killings by State officers. But according to Musamali, a former police officer himself in the dreaded General Service Unit (GSU), this institutionalisation is not new. However, he blames Kenyans for also embracing it and, in some cases, celebrating the killings. “It is not all Kenyans that are making noise about extra-judicial killings. We are only talking of the civil society and the Muslim community,” he says. Even the noise from the Muslim community only started after Kenya started its fight against terror and the emergence of Anti-Terrorism Police Unit (ATPU), when members of that faith suspected of links to terror networks started disappearing. “But as Kenyans we need to look at the history of extra-judicial killings in this country, especially State involvement in this,” he says. To trace the history of extra-judicial killings in Kenya, Musamali argues that one has to look back to the 1970s. “These extra-judicial killings were mostly being committed by one cop, a police reservist known as Patrick Shaw. He was involved in a lot of extra-judicial executions and (funny enough) he was celebrated as a super cop. People who were there then would attest to this,” he offers. Some of Shaw’s victims were Nicodemus Arudii, a Gor Mahia player and a suspected robber. He was reportedly picked from his mother’s business premises and went and got executed. Others were notorious gangster Wakinyonga. However, at the time of Wakinyonga’s killing, he was not armed. “He had been surrounded and instead of being surrendered and the due process followed, Wakinyonga was shot by Patrick Shaw,” says Musamali. “Even then, we were not looking at these killings in that way as it being unlawful. Instead, every time there was such a killing, there was celebration from members of the public,” he adds. Stories were being told where Patrick Shaw would come and offer a suspect bus fare to leave the city and travel upcountry or else the suspect would be found in City Mortuary. “We celebrated him and treated him as a hero. We have police officers who are held in awe by members of the public, not because they are doing proper police work but by virtue of killing suspects without taking them to court. Names are there. They are on record,” says Musamali. Exit Patrick Shaw and enter the 1980’s and 1990’s with the creation of the Flying Squad. The Flying Squad, NLM learnt, was staffed with officers selected from the elite GSU Recce Company, and they had just one mandate: to execute. Some of the Flying Squad’s known victims were Wanugu, Rasta, Shimoli and Matheri. “They were only suspected armed robbers but ended up being killed by officers from this unit. These officers were celebrated and it is a fact that most of the officers who were involved in these killings earned promotions,” adds Musamali. In the case of Matheri, who was killed in Athi River, his house had been surrounded by dozens of police officers who had the option of arresting him but chose not to. Instead he was shot lying face down. “Kenyans did not make noise. Instead we celebrated the cops then. If you went to police camps, those deployed to the Flying Squad were demi-gods in terms of their treatment. They were worshipped, not for anything else like investigative skills, but because of the killings they carried out. “We had officers who were promoted right from constable right through the ranks to superintendent of police as a reward. These officers, who were deployed to the Flying Squad, did not have any other qualification other than being ruthless and straight shots – very skilled at arms. “There are very many who are still in the force. I don’t want to mention names but we have people in senior positions. We have people heading departments in DCI (Directorate of Criminal Investigations), including some officers currently heading the DCI in the counties, who were promoted in that way,” he says. It was also during Philip Kilonzo’s tenure as Commissioner of Police when a number of these extra-judicial killings were committed; the Flying Squad was answerable to nobody except to the Commissioner. As the Flying Squad became a law unto itself, it is understood that it got to a point when they started turning their guns on each other. Reportedly, this is how Corporal Turunya, Inspector Tayan and Chief Inspector Sirorei, among others, went down – killed by their fellow officers. “Unfortunately, that time, save for the immediate family members, nobody raised a finger,” Musamali narrates. Instead, as it happened in Githurai not long ago when Titus Ngamau alias Katitu) was arrested for alleged killings of two brothers, members of the public went out in the streets to demand that he be released. At the time of Michuki’s remarks, it was the suspected Mungiki youths who were the targets. People believed to be police officers from the Special Crimes Prevention Unit (SCPU) reportedly picked up many of the Mungiki youths and executed them at Kinari forest. It was not just suspected Mungiki adherents alone that were targeted but human rights defenders as well. 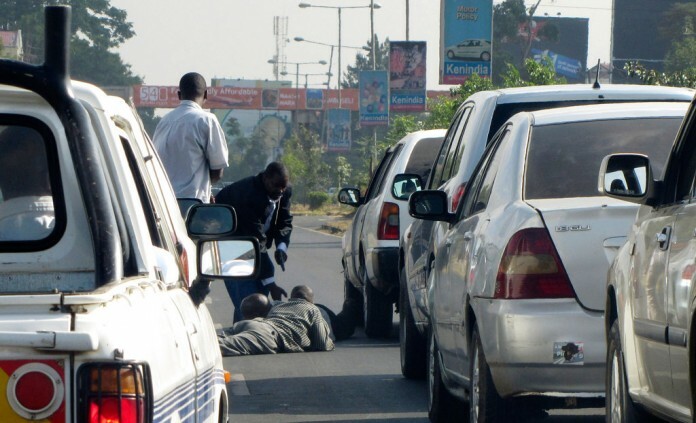 On March 5, 2009, Oscar King’ara of The Oscar Foundation, and his assistant, John Paul Oulu, were ambushed and shot in a traffic jam not far from State House, the President’s residence. Kinari forest, like Ol Donyo Sabuk River and Mount Kenya Forest, have often provided the best dumping grounds; the perpetrators believe it is easy to conceal bodies in these places. Reportedly, the police hierarchy approved these killings. “It is allowed from the top-down. I have a case where the junior police officers reported that they had arrested a certain suspect and the instructions from the commander was ‘waste him’, meaning ‘kill the person’,” says Musamali. After the emergence of Al-Shabaab – along with so many terrorist threats and outfits in the country – the ATPU was born. The unit has been accused of extra-judicial killings of people they suspect to be sympathisers of the Al-Shabaab or those suspected to be engaged in acts of terrorism. These include Muslim clerics Ibrahim Omar and Aboud Rogo Mohammed. Not long ago, the body of a lady known as Isnina Musa Sheikh was discovered in a shallow grave in Mandera’s Lathe Village. Interior cabinet secretary Joseph Nkaiserry justified her killing by saying that she was an Al-Shabaab sympathiser. Now, it is no longer just the police involved in the killings but also gangs acting on behalf of certain powerful individuals. The targets have been broadened to include the likes of Willie Kimani and journalists like Francis Nyaruri, John Kituyi and most recently, Joseph Masha. “The situation is as bad as it was then; it became a culture. That is why even the APs are responsible for more executions now than the even the regular police. “We had the case of the lawyer who was executed, the young man who was killed in a hospital ward at the Mwingi Level Four Hospital and the accused are police officers, and the nurse who was arrested in Meru and body found in Machakos. We have had so many cases around Kinoo and Kikuyu, young men being arrested and executed in Kinari” Musamali concludes. Our efforts to get Police to comment were met with stone-cold silence.